Ludum Dare #34 is coming, and I have problems participating. Anyway, here is a warmup game. I wanted to do something like this for a while. 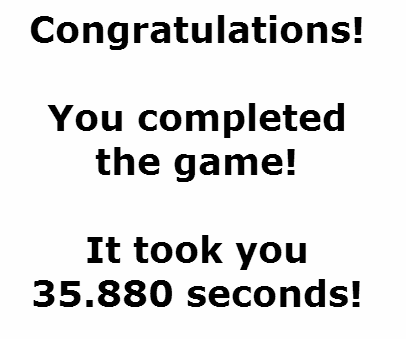 After several tries, I completed the game in 40 seconds. That's what it said. Let's see if anybody will be close to that. woo! This is cool Madball! I took my time and took 285 seconds. didn't really go fast because I was trying to avoid being hit. I think it would be better if the health didn't regenerate, then see if you can beat it at all haha. re-tried and it took me 104.28 seconds, and I thought I was rushing... Are you sure you didn't have some sort of machine gun when you did this in 40 seconds? 89.84 seconds... and I booked it and didn't kill half of them... i still think under 40 is impossible without a machine gun. Did you notice that it's in the "puzzles" category? 103 seconds, I can't understand it! I thought I would do really good! Seems like BioManiac found something useful. I wonder what. You can move a box to block the top door from closing. Then press the switch and walk out, skipping the box-pushing puzzle. There is also a faster version of this trick. Surviving enemies in the bottom is necessary (it\'s not that hard). Fighting the boss isn\'t required though. How about walking out of the elevator after activating it? Also, I'll give you the first part with the door being puzzle-like, but the 2nd part to avoid the boss isn't puzzle-like at all imo, it's more of an exploit... even if it is intended. 67.29, I used a box to activate the elevator and walked out, past the boss. The only other object to block the gate would be an enemy, and I don't think it will work.